—This article by Jerry Cates and Galina Z., first published on 8 August 2010, was last revised on 24 April 2016. © Bugsinthenews Vol. 11:08(02). The positioning of the eyes (see Ubick et al, , pg. 214) is consistent with spiders in the genus Phidippus, but the pattern of the dark marking on the dorsal abdomen is not typical for a P. johnsoni female, as described by Kaston, or by the Peckhams. This may be a female, though based on the morphology of its palps, which are not markedly swollen the way a male’s palps typically are in other spider families, and the absence of any suggestion of emboli (one has to look at the distal palps on both of the photos Galina supplied, as the first photo, above, does seem to show some minor distal swelling). However, in the Salticidae family, the emboli of the male’s palps are often not remarkably different from the distal segments of the female palp. My previous article referenced by Galina portrays a male Johnson jumper, whose abdomen is entirely red but whose carapace is, like this one, entirely black. The black carapace, and red dorsal abdomen, are characteristic of the Johnson jumper, but also of a number of other species. A typical female Johnson jumper has a broad, median black band on the posterior two thirds of the dorsal abdomen. The margins of that black band, however, are only lightly incised, and do not show any interior spotting (Galina’s specimen has significant lateral incisions, and two prominent red spots). Still, much variation exists within species. The literature on the Johnson jumper seems particularly varied, even frustratingly so. 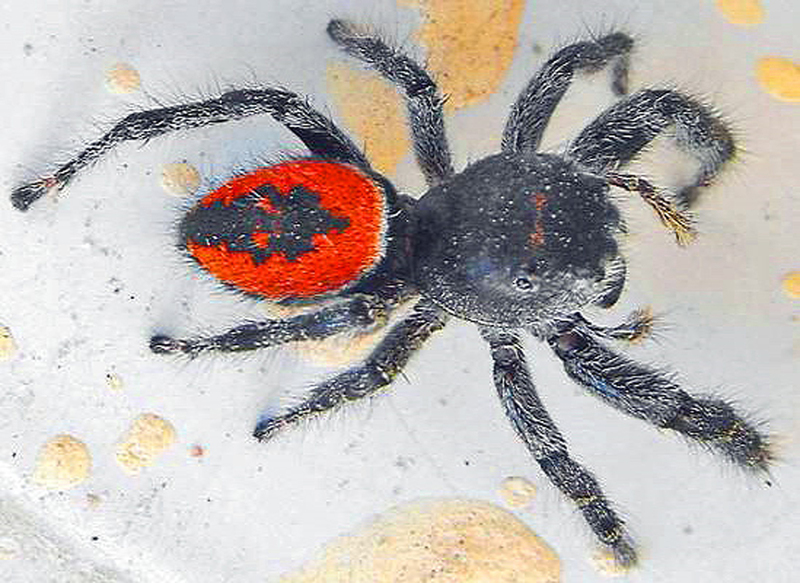 On the other hand, it must be pointed out that a number of other jumping spider species found in North America have considerable amounts of red on their dorsal bodies. This could be one of a number of such species. If you happen to be privy to information that points in a specific direction, please let me know. In the meantime, I will be doing some serious homework on this genus, to try to get to the bottom of things. Methinks the first order of business will be to acquire the acclaimed revision of the genus Phidippus by G.B. Edwards (2004) and take advantage of its keys. Another photo taken by Galina shows the face of her specimen and gives an excellent view of the distal segments, i.e., the tips, of the pedipalps. These are the small appendages that look like smallish legs directly in front of the face. A male might have remarkably swollen tips, but these are about the same size as the other segments and, as pointed out earlier, such distinctions are not so marked in the Salticidae as in other spider families. Notice the two large headlamp- like eyes (the anterior median eyes, or AME) facing directly forward, and the smaller anterior lateral eyes, also facing forward, above and further to each side of the face. The four posterior eyes are positioned on the crown of the carapace. The genus Phidippus is in the Salticidae family which, along with the Lycosidae and Thomisidae, is considered a “modern” hunting spider. For such spiders, excellent vision is crucial for capturing prey and for mating. 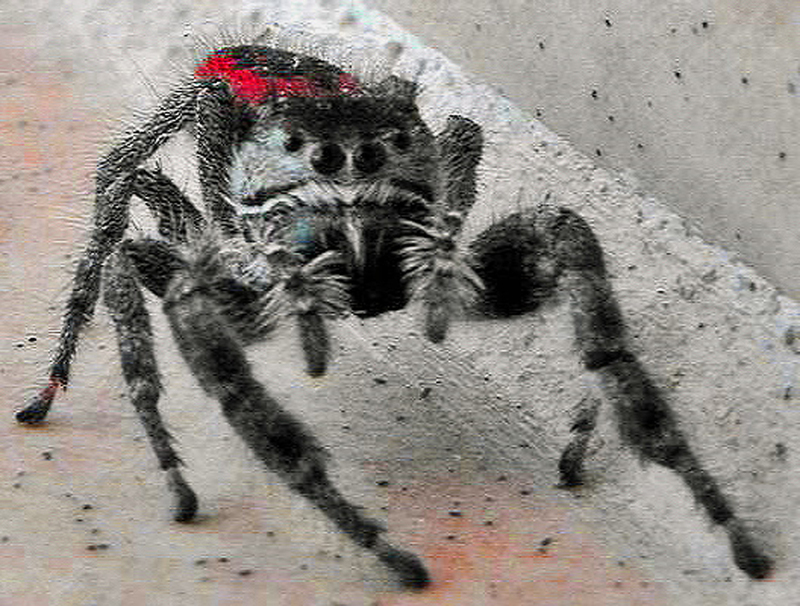 Rainer Foelix, in his “Biology of Spiders, 2nd Ed.” *(1996), p. 82, points this out, and adds that jumping spiders kept in the dark or under red light cannot catch prey or find a mate, and even if a fly bumps into such a spider that is deprived of visual stimuli, she will not attempt to seize it. That testifies to how critical vision is to these spiders. *For those who want to learn more about the biology of spiders, Foelix’s now-released “Biology of Spiders, 3rd edition” is available for purchase at most fine booksellers. I enjoyed the 2nd edition so much I couldn’t wait to see the new 3rd edition of this outstanding book; it met all my expectations and more.